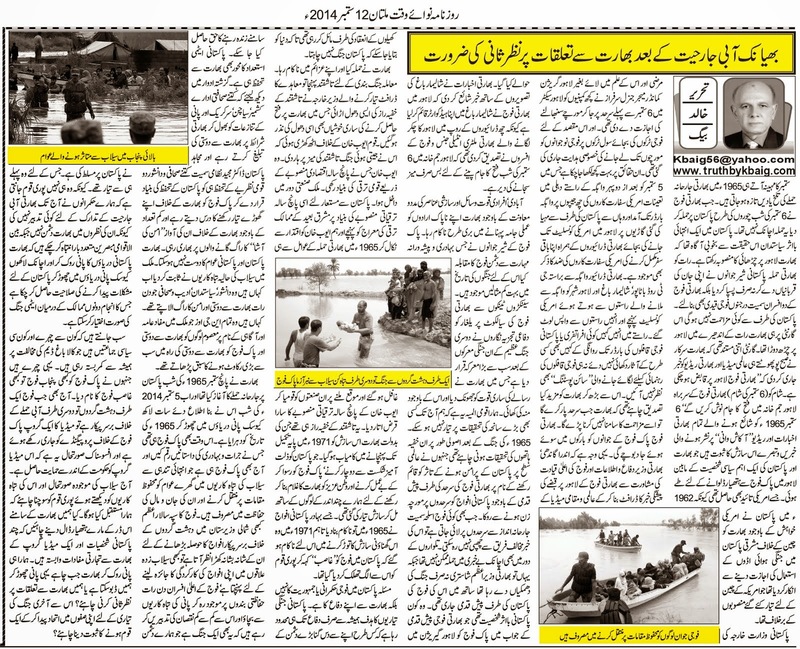 Truth by Kbaig: Need to Revise Relations with India after Worst Water Aggression!!! Need to Revise Relations with India after Worst Water Aggression!!! Month of September makes us remember the aggressive Indian attack over Pakistan when on the night of 6th September 1965; Indian army trespassed into Pakistani boundary. This was not a sudden attack; a very influential politician of Pakistan was fully aware of this attack over Lahore. The night attack by Indian army was not only repulsed by brave soldiers of Pakistan army at the cost of their lives but they also took dozens of Indian army soldiers including 2 Indian army officers as Prisoners of War. On the guarantee that there will be no resistance from Pakistani side, India attacked Pakistan. The guarantee was so much certified that Indian govt. announced on Indian radio and all the newspapers early in the dawn of the 6th September 1965 that “Indian army had captured Lahore and Indian Army Chief would celebrate victory in Gymkhana Lahore in the evening”. The news broke by Indian Radio and newspapers of 6th September 2014, are the evidence of the conspiracy finalized between India and a Pakistani politician which was prepared to make Pakistan army surrender in front of Hindu Indian army. This conspiracy had the support of USA as well because in 1962 Pakistan had denied to provide airbases of Eastern Pakistan to India during China Indian war; this denial was against American plan laid down against China. Without informing and taking formal permission from Pakistani Foreign Ministry; Major General Sarfaraz, Garrison Commander Lahore ordered few units of Pakistan army to take up the defense line and make bunkers on Lahore boundary ahead of 6th September. Moreover, troops were ordered to use civil trucks in spite of military trucks for their movement. These bitter realities including visit of American Diplomats to US Embassy in Pakistan on 5th September 1965 in Indian Jeeps along with Indian drivers to Lahore via Wahga Border (despite of provision of transport by Pakistan on border) have been highlighted various times. Indian drivers arrived US embassy in Lahore via Wahga, GT Road Batapur, Shalimar Garden and Lahore City and returned to India. On the way they did not observe any emergency, movement of troops or sign posts fixed for guidance of military convoys. What else evidences was required by India that when Indian troops would cross the border they will not face any resistance and Indian army will take Pakistani soldiers sleeping in their barracks. Due to such certified guarantees, with mutual consent of Indira Gandhi, Indian Defense and Information Ministry a draft of announcement that Indian army had captured Lahore was handed over to International and Local media in advance. Indian newspapers published the news with the pictures of Shalimar Garden that Indian army had established its headquarters in Shalimar Garden Lahore because 6 Indian spies who visited Pakistan under the garb of Indian drivers of American Diplomats confirmed that India had only to set the tables in Gymkhana Lahore to celebrate her victory against Pakistan. Despite of population, manpower, resources and help of traitors within Pakistan, India failed to fulfill her conspiracy. In the way lions of Pakistan army repulsed Indian attack one would hardly find examples of such professionalism and bravery. The biggest attack of tanks over Sialkot by India army is termed as the second biggest attack after World War in which India used her full power of Armor but she had to lick the dust. One of the tragedies of Pakistan is that we had never been united to investigate the reasons behind any big conspiracy. Principally, role of those unseen powers in 1965 war should have been investigated who tried to stop Pakistan army from preparing for Indian aggression despite of movement of Indian troops towards Pakistani boundary in the name of maintaining the expression over International community that Pakistan is a peaceful country. It is impossible to hide the news of movement of troops towards border; even in the time of the swords a sudden attack was impossible, whereas, here Indian Prime Minister Shastri was threatening to attack Pakistan, Indian troops were moving towards Pakistani boundary. Who was that influential political figure who forced Pakistan army to stay away from border and arrange sports festival at Lahore Garrison in order to show the world that Pakistan does not want war? In 1965 India attacked Pakistan and was defeated; ceasefire was to be signed in Tashkent, Foreign Minister of Pakistan who drafted the deal of Tashkent made such rumors of Tashkent pact that the victory over India was suppressed under these rumors of Tashkent pact. Nation stood up against Ayub Khan that he lost the won war on the table (while Ayub Khan had not drafted or signed the Tashkent pact). Ayub Khan who laid foundation of the Five Year Economic Plan national development, country entered into Industrialization. Copying this Five Year Economic Plan many countries of far east attained the goal of development and we ousted Ayub Khan from power ignoring the elements responsible for 1965 war. As soon as these elements came into power they reversed the development and industrialization by nationalizing the industry. These were the rumors of secrets of Tashkent which supported India to fulfill her conspiracy against Pakistan in 1971. This was the result of the conspiracy which was prepared by the few traitors within Pakistan to insult Pakistan with defeat, insult Pak army with surrender and neutralize it and make Pakistan slave to India. This conspiracy was repulsed by Pak army in 1965 but in 1971 due to the traitors of motherland Pak army failed to face this conspiracy as Pak army was being termed as “Usurper (Ghasib)” and a gulf between nation and army had been created. Democracy or military dictatorship is not the actual problem; the problem is defense from India. Our defense policy had been always focused at defense of Pakistan from ten time’s bigger enemy within limited resources and budget. The pivot point of Pakistan’s nuclear capability is also defense against India. One can easily compare the media houses who are busy in brain washing Pakistan to forget about Kashmir, Siachen and Sir Creek disputes and start friendship with India over insulting terms while few journalists like Majeed Nizami preached that Ideology of Pakistan is the base of defense of Pakistan and vowed Pak army to be prepared against any Indian aggression, although, they were few in number, however, they remained superior to those singing chorus of Indian AMAN KI ASHA for dollars they receive from India. India can never become friend of Pakistan or Pakistani public; this has been proved by the havoc wreaked by current artificial floods in Pakistan. Where are those journalists, intellectuals and singers of chorus of AMAN KI ASHA with India? Where are those foreign funded NGOs who were brain washing Pakistanis for slavery of India and claiming Pakistan army as one of the biggest hurdles in the way of friendship with India? On the night of 5-6th September 1965, India attacked Pakistan and she had repeated the history by dropping water bomb over Pakistan. 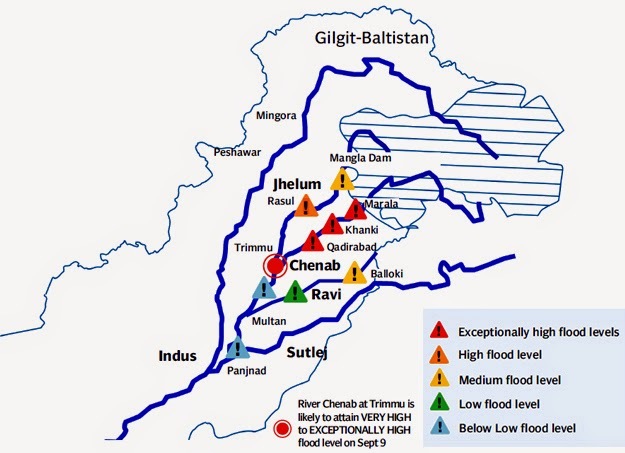 On the night of 5-6th September 2014, India opened gates of her dams without informing Pakistan which pushed flood water of more than 0.7 million cusecs into Pakistan. 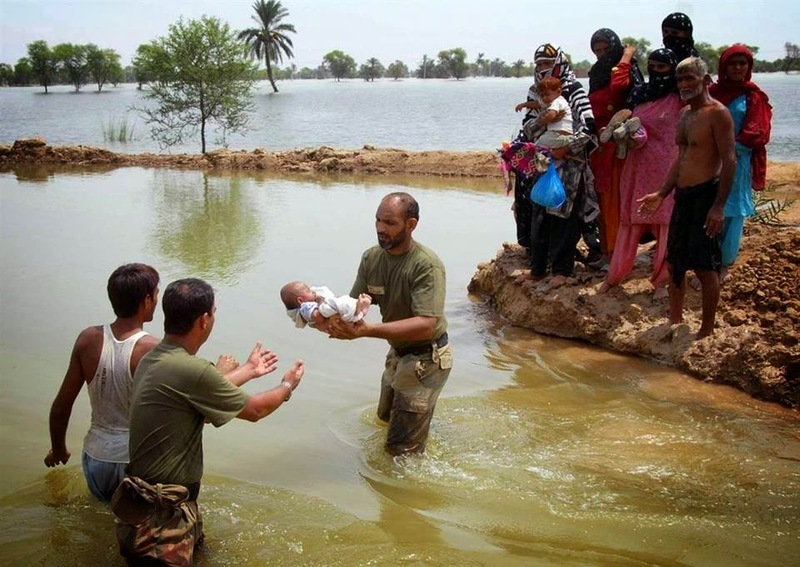 In 1965 this was Pakistan army who wrote the history of valor and bravery with the blood and once again in 2014 this is Pak army busy in saving the public encircled by flood waters. 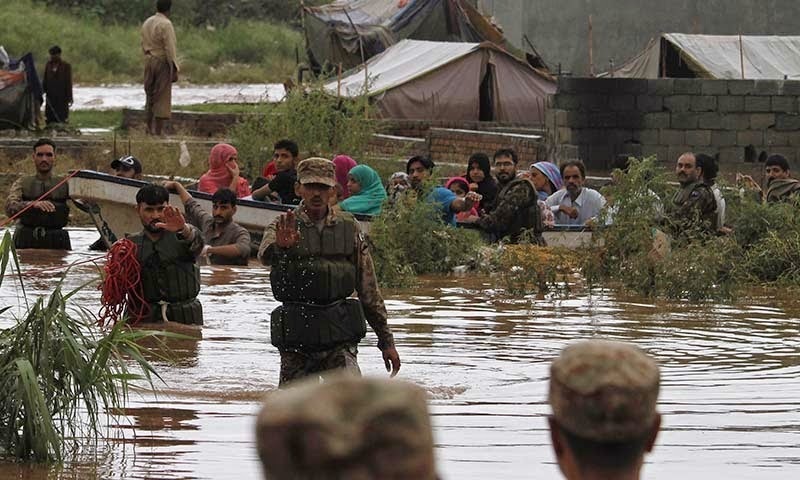 Chief of Army Staff is seen standing side by side to the troops fighting against terrorists in Northern Waziristan or supervising rescue operations for flood effected Pakistanis. 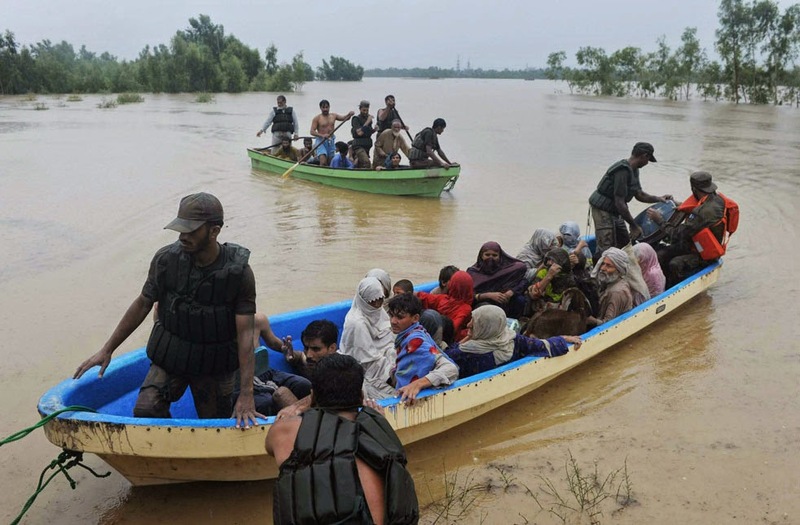 Higher officials of Pakistan army are busy in preparing plans to safeguard flood bands and evacuation of effected people to safe places; because, this is also a water war imposed over Pakistan by eternal enemy. 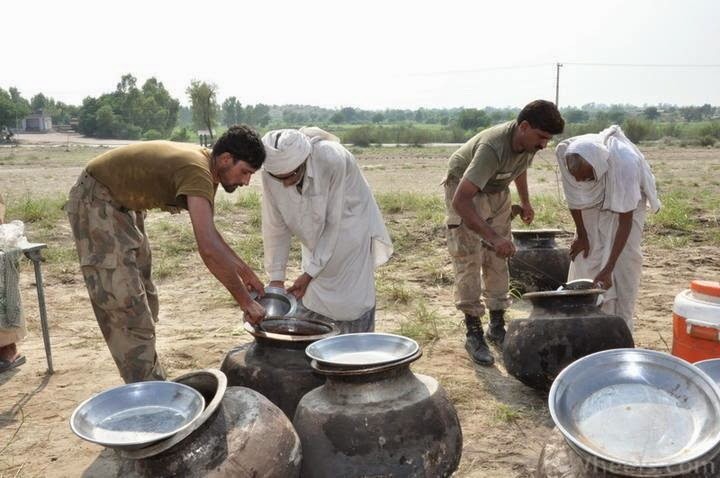 Pak army was already planned for such water aggression; not only army but nation is also aware that our rulers had never taken step to protect Pakistan from Indian water bomb. Our rulers having investment in India does not take her as enemy while international analysts have warned Pakistan various times that India can create problems for Pakistani by stopping the water of Pakistani rivers and releasing millions of cusecs water from her dams anytime; which would result in nuclear war between both countries. Everyone is well aware of the elements and parties who are always against construction of any dam especially Kala Bagh Dam. These are the elements who blame Pakistan army as Punjabi army and Ghasib Army. At present when Pak army is facing terrorists on one front and flood waters on other, a media group is busy in propaganda against Pakistan, bitter reality is that this media groups is supported by the elements in the govt. Nation should consider the devastation of the floods and take it seriously that what would be our future? Should we surrender in front of India because few political figures and a media group has interests linked with India, stopping water of our rivers India can create floods anytime in Pakistan, should we fear India or revise our relations with her? Should Pakistani nation get united to prepare for a final war?? ?